This old abandoned building Alameda is located at the intersection of Mariner Square Drive and Marina Village Parkway. According to some sources the “abandoned insane asylum” was actually a military hospital, or a storage facility for the United States Military. At any rate, most people who knew about the abandoned hospital/insane asylum in Alameda were unclear about the actual function of the building and speculated on its use based on the way it looked. The building was originally built in 1941 as a hospital and dental unit for military presonnel. It also was a distribution point for medical supplies and equipment in the Bay Area. By the 1970’s, it was no longer used as a hospital or dental clinic. It became known as the Navy FISC Administration Building and continued to function as a distribution point for supplies. By the mid-1990’s, the Naval Air Sation Alameda, California was officially closed and the FISC Administration Building was abandoned. It became a target for vandals, drug users, and teens looking for adventure. Rumors of dead bodies in the building are false. No bodies were ever found in the building by police officers. At some point during its abandonment and decay, it became famous as the “Haunted Insane Asylum”. Apparently, beliefs about this building and its “haunted” status roused a lot of anger in certain groups and hype in others. 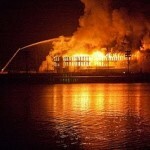 Unfortunately, this 150,000 square foot building burned down on March 29 of 2009. Visitors to this location have reported that they could hear disembodied screams and voices upon walking in the door. Blinds on the windows (particularly on the second floor, fifth window from the right) would open and close on their own, without explanation in this abandoned building. Feelings of uneasiness have been reported at this location. People have reported capturing ghostly anomalies and orbs on film.